Fascinating to learn she is not a vegetarian – I, like many people, always assumed so! Me too, marthaandme. I thought the same about Deborah Madison (Vegetarian Cooking for Everyone, ex-Greens etc.) but she, too, is an ethical omnivore. I enjoyed reading this interview, Sarah. I’ve been a fan of Moosewood Cookbook for many years. Molly’s new cookbook sounds wonderful. Even though I “know” how to cook, sometimes it helps to simplify! I’ve heard of this chef – but I’d like to check out the Moosewood Cookbook. Nice interview. I’m always interested in basic cookbooks and, lately, ones that reduce the meat. Thanks for letting me know about this. You’re welcome, Nancy. As you’ll see from Mollie Katzen’s cookbooks, she’s all about lots of greens and whole grains. Everybody has a right to make their choices about diet. I think it’s best if they are very well informed choices, as Mollie’s are. As much as I’d like to spread the good word about vegetarian choices, after all these years, I get it that most people are not going “all the way,” so cutting back and choosing clean is better than nothing. Mollie did so much for the veg cause with her books, she will always be a hero. I think it’s great when a confirmed vegetarian can calmly and kindly acknowledge the important role of a modest meat eater in advancing the cause of a mostly plant-based diet. 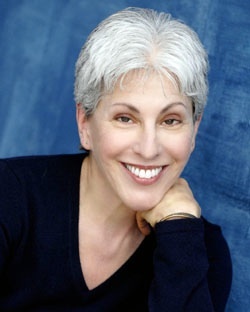 I really love Mollie Katzen and have been using her cookbooks for years. I’ve never seen a picture of her. She’s so gorgeous. THANK YOU for this interview, I really enjoyed reading it and am in awe that you know her Sarah! Oh–and I went to college at Cornell where Moosewood is located. I miss it!